CHICAGO – In the latest HollywoodChicago.com Hookup: Film with our unique social giveaway technology, we have 25 pairs of movie passes up for grabs to the advance screening of the highly anticipated new “Fast & Furious 6” starring Dwayne Johnson! “Fast & Furious 6,” which is rated “PG-13” and hits theatres on May 24, 2013, also stars Vin Diesel, Paul Walker, Jason Statham, Michelle Rodriguez, Ludacris, Tyrese Gibson, Jordana Brewster, Luke Evans, Elsa Pataky, Gina Carano, Gal Gadot, Sung Kang, Lee Asquith-Coe and Shea Whigham from director Justin Lin and writer Chris Morgan based on characters by Gary Scott Thompson. To win your free “Fast & Furious 6” passes courtesy of HollywoodChicago.com, just get interactive with our unique Hookup technology below. That’s it! This screening is on Tuesday, May 21, 2013 at 7 p.m. in downtown Chicago. The more social actions you complete, the more points you score and the higher yours odds of winning! Vin Diesel, Paul Walker and Dwayne Johnson lead the returning cast of all-stars as the global blockbuster franchise built on speed races to its next continent in “Fast & Furious 6”. Reuniting for their most high-stakes adventure yet, fan favorites Jordana Brewster, Michelle Rodriguez, Tyrese Gibson, Sung Kang, Gal Gadot, Chris “Ludacris” Bridges and Elsa Pataky are joined by badass series newcomers Luke Evans and Gina Carano. Building on the worldwide blockbuster success of “Fast Five” and taking the action, stunts and narrative to even greater heights, “Fast & Furious 6” sees director Justin Lin back behind the camera for the fourth time. He is supported by longtime producers Neal H. Moritz and Vin Diesel, who welcome producer Clayton Townsend back to the series. The movie poster for “Fast & Furious 6” starring Dwayne Johnson and Vin Diesel. 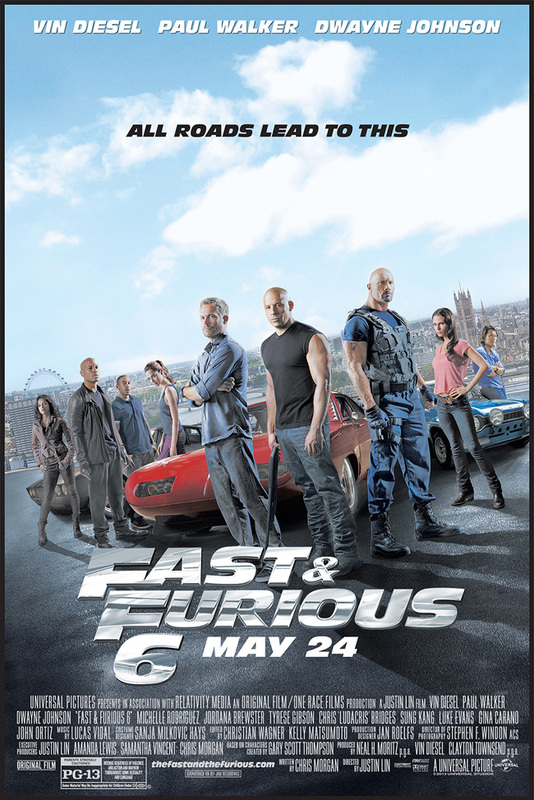 The trailer for “Fast & Furious 6” can be watched now below. This HollywoodChicago.com Hookup is simple! Just get interactive in our unique Hookup technology above. We will award 25 admit-two movie tickets based on social entry numbers and/or randomly via e-mail for our “Fast & Furious 6” Hookup. Good luck!